Thanks to the The Poptropica Help Blog (PHB) and Adventure Time Pop for most of these codes! If you get far enough on Nabooti Island, you’ll receive a cell phone that you can put numbers in. Use these numbers to get their items! Disclaimer: these codes only work on classic Poptropica islands and will NOT work on Poptropica Worlds or islands with music/sound. Disclaimer: this only works on classic Poptropica islands and will NOT work on Poptropica Worlds or islands with music/sound. Push S on the keyboard while a Poptropican is speaking to skip it. (Note: If it did not skip it, click the screen. This should solve the problem.) This is particularly useful if you would like to compete against other Poptropicans for island stopwatch times on our Boredom Busters page! If you’ve gone through the Poptropica Creators’ Blog and have come across any of Binary Bard’s posts, you may have discovered a sequence of 0’s and 1’s near the bottom. You can actually translate these using a Binary Code translator! Hypnotic: This card is for Members only, but non-Members can get it, too! Here’s how: Go to Poptropica Towers on Early Poptropica Island. Then, find the green tower. Jump up on the windowsills of the green tower, until you see the second flower pot you come across when climbing this tower. On the window-tile just above it, hover your mouse. Click it when your mouse turns from an arrow to a pointer. “Hypnotic” will be added to your inventory! Skull Mask: Have you ever seen those sneak peeks with two Poptropicans in it that have that weird animal skull mask thing on? Have you ever wondered where they got it? Here’s how! 1) Go to Legendary Swords. 2) Go in the second part of the cave. 3) Look for the mask among the fossils. 4) Click on it. You now have the skull mask! Viking Suit: Do you want a Viking suit in your inventory so you don’t have to go to Time Tangled Island to customize a Viking every time you want one, but don’t know how? Here’s your answer. 1) Go to time tangled Island. 2) Go to the time of the Vikings. 3) Jump up to the ledge the cave is on. 4) Go to the right edge of the ledge. 5) Put the glider from Leo’s workshop on. 6) Jump to the right. 7) If you did it right, you should land on another mountain. 8) You will see a pile of clothes. Walk over to it. You now have your very own Viking suit! Sadly not. The only followers you can get are in the Store. Okay, I’ll take them down. Oh, yep! I just took it down. I know. Best method to get new costumes. Sorry, but we don’t have any dummy usernames. 😦 Although, you can friend other people on our Fantastic Friends page! I have one of the dummy(s) on my account. By “dummies,” they’re actually referring to Poptropica characters that you can customize anything from in the game, even if you usually can’t. You can find some on the PHB, or Keith Sammut’s blog. This is really interesting! But do you have anymore codes??? Nope! But we do have a Glitches page you can check out. Hello! Sadly this is the page for cheat codes in Poptropica, but I can add you to the “Fantastic Friends” page if you want? DS game… And if you do please help me unlock the costume . I have the DS game. What costume do you want? The wimpy2012 code expired, I went to go look and I typed it in. Bye!! Check the Top Pop, I have translations for all of his random numbers!!! On every post!!! Okay, I have a question. I once saw a Poptropican holding a book. Is this a handheld item you can get by using the randomizer cheat, or is it something else? It’s something else. It’s a very rare cheat that barely anybody knows. Hey thanks! 😀 And is Happy Rider (smoothiefairy) your account? Can someone tell me what the FIRST two DRHARE codes got?? I remember one was a Carrot Costume, but I don’t remember the other, and I need it for my Cheats page. Even though it’s expired. Ohhh, I thought that was 5000 … I need to get with the program lol. We know. Hl that’s why we dot have it on the page. 😉 Thanks for the tip though! Add the code DRHARE5000 it still works. I just tried it out and it works fine. Silver wolf,do you want to join my multiverse.The code is BBT72.Anyone else can join too. DRHARE5000 doesn’t work anymore does it? Hmm. I guess it works. Uh, the Dr. Hare balloons code doesn’t work. Okay, I’m REALLY sorry for saying sorry a million times and for being annoying, but I was just wondering out of curiosity, and I DON’T want to know the password(s), but I was wondering do you know the password(s) for the VIP and/ Super Secret items section on TI’s Blog? Again just wondering. I heard all of them except 2 glitches on the Super Secret were on other blogs, and the creator’s are fixing glitches, so I doubt they work anymore. I have to go! I’m sorry. The multiverse room code like the one that I gave you. Could you announce the code whenever it gets released? I went on the website but I have no idea what to do. It’s weird. Well, what do you mean? I don’t quite understand. Are you going to Tough Icicle’s party? Hold on! Deleted it by accident! Go to room DFT95 instead. the other room was messed up. 2 minutes left! Okay this will be a friendly competition! Is it okay if my sis is there too? This is a heads up! The multiverse party will be in about 15 minutes. Please come Sliver Wolf, and lets see what your made of! Yeah, you are, 😛 Remember? SS took you down! Denial! It was… IDK how long ago. LOLz. Did you know LOLZ means Laugh out loud zebras?!?! ((”’)(”’) I LOVE THESE BUNNIES!!!! Seriously! It’s okay Silver Wolf. I don’t mind. But I plan on making one at about 5:00 Central time. Sounds okay? Is there some kind of sdrawkcab day I don’t know about??? Uoy wonk tuoba eht sdrawkcab rotalsnart oot? Llew, ot esu ti, og ot eht yranib edoc rotalsnart dna kcilc no txet sloot dna kcilc eht esrever rotalsnart. Ereht si on sdrawkcab yad, tub ereht si na lanoitanretni klat ekil a etarip yad! Ti si no September 19! Ti si laer! I ma ton gniddik! Hcraes no elgoog! Yarr, Ye’d better, or ye will need to prepare to be boarded! 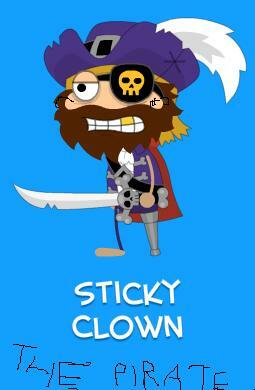 And I’m also a pirate king! Yarr… no ye be not. I be the pirate king! Do ye be insultin’ me tribe? SC: Nay,I be just pointing out a fact. 😐 Also,it took you months to complete Skullduggery,but I completed it in a day. Yar, A good pirate also needs a good name! I be able to think of an awesome name for that costume! Can ye think of one?